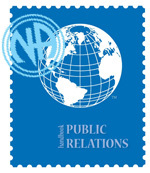 This page is the gateway to public relations resources gathered over the years. Some of the resources presented are for historical purposes and should be reviewed for contemporary application before using in your subcommittee, if applicable. In addition, there is a wealth of information on NA service and public relations at the NAWS website, take a look at the Local Service Committee Resource area. On the link bar below you can access pages that display resources for PR work. We divided the pages into categories we think are relevant. For materials on actual public relations work, please start from The Work Itself page. There are additional resources for public relations that are available from Narcotics Anonymous World Services (NAWS) through their web site at http://www.na.org. Business hours are Monday through Friday, 8:00 AM to 5:00 PM local time. The office is closed on USA holidays. The local standard time is GMT minus 8 hours (advance 1 hour from March to the end of October and return to standard from November through February). On the Bulletins page of our website you can see a partial list of bulletins authored by the former World Board of Trustees and the current World Board. You can access these bulletins by hyperlink to the NAWS web page here or by clicking on the highlighted text on that page. Also available on this web site are Published Abstract Papers approved by the former Board of Trustees for use by the Fellowship in presentations and on the Internet and others used for presentations to international organizations. These abstracts are presented for historical purposes and NA World Services should be contacted for the most recently approved abstracts. We always wish to expand the materials listed here. If you have any resources used for public relations activities that you wish to have included on this site, please contact us (use the form found below). Below we’ve selected PR materials for your perusual. We’ve provided them in various formats. To download a file, right-click on the desired file format and choose “Save Target As…” or “Save Link As…” depending on the type and version of the browser you are using. Historical: Open Meeting Anonymity Statement: Open Meeting Anonymity Statement: Used for open meetings or PI presentations, 1 page, available on this web site in English. Fellowship Intellectual Property Trust: NAWS statement on copyright materials, available on the NAWS web site. Historical: A list of commonly/frequently asked questions with suggested answers, available on this web site in English. NA Public Information Service Bulletin: “Public Information use of billboards and bus signs.”, available on this site in English. Sample Radio Interview: Script of a mock radio interview (revised in 1999), an updated version available on this web site in English. Historical: Considerations for Meeting Lists: Suggestions from WSC PI on creating meeting schedules, 1990, available on this web site in English. See our Sample Posters & Flyers on this web site. Available for purchase from NAWS (search the online literature store under “Specialty Items”). Historical: Press Release Guide: Guidance from the former WSC PI Committee on writing a press release, available on this web site in English. Historical: Asia Pacific Forum Presentation Training Kit – Section 3 only – updated version that was presented at the Western States Learning Days Convention, November 2001, available on this web site in English.